How is it a Stalemate? Hello, I am a beginner. I'm reading a book about chess basics, and am confused by one test question given by the author. Would appreciate it if someone could explain! Set up: WK on b5, WP on b6, BK on b8. My question is - why can't black king move to c7? 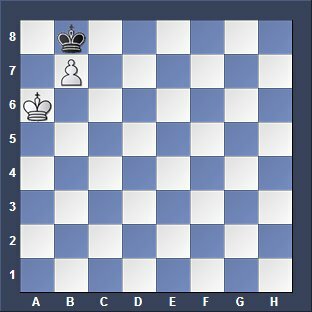 Surely that's a flight square, and therefore BK is not in stalemate? Would really appreciate some patient help, I might be missing something obvious here, but please remember am a complete beginner. Thank you. 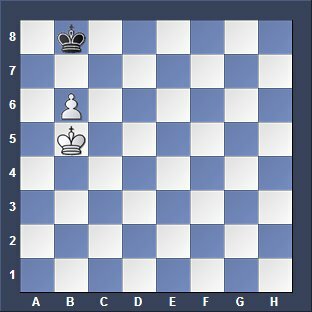 The black king cannot move to c7 because it is White's move and not Black's move. White must now give up the pawn or stalemate the black king. Keep in mind that Black wants to get into a stalemate because he is a pawn down and a stalemate would give him a draw. So Black would never try to avoid the stalemate but would love to run into it. White wants to win because he is a pawn up but he can't win this position. So when you have the white pieces then make sure that you avoid a position like this. Think ahead.